Removable Covers are made from thick 6.7 oz. heavyweight polycotton twill fabric, not the thin sheeting material sold by many others. � Choose from 22 colors. � 6.7 oz heavyweight polycotton twill fabric. � Micro denier fiber fill insert. We ship out bolster pillows via UPS with tracking. Most orders ship out within 24-48 hours. The manufacturer warranties this product to be free of defects for a period of 30 days. In most cases, they will simply ship you a new set of bolster pillows, however they may elect to repair it at their discretion. 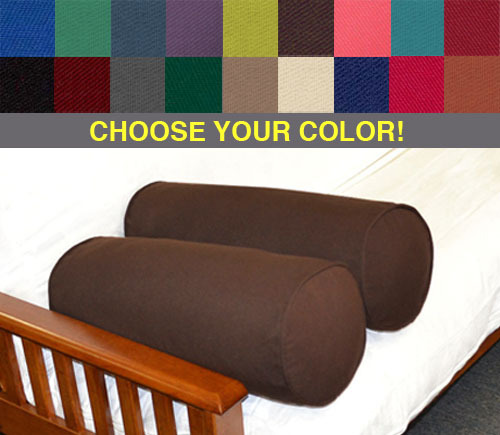 The manufacturer will pay the shipping to send any covered warranty repairs or replacement pillows to you.